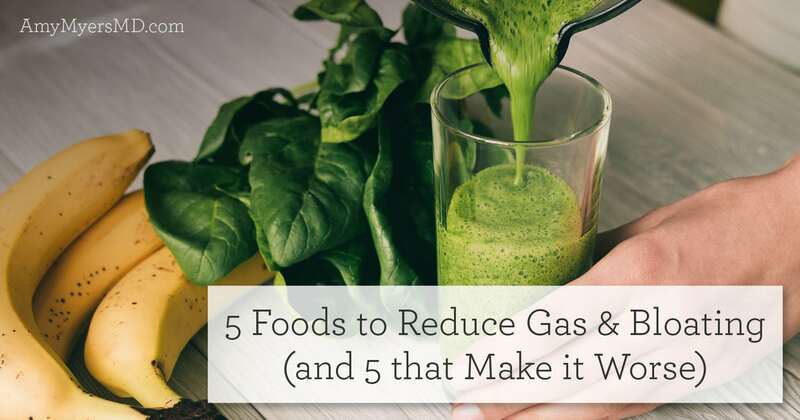 Although none of us wants to admit it, gas is something we all deal with on a daily basis! It’s a completely normal process that occurs when we digest our food. Still, this doesn’t change the fact that passing gas in social situations can be embarrassing. And sometimes gas and bloating become severe enough that it’s uncomfortable or even painful. 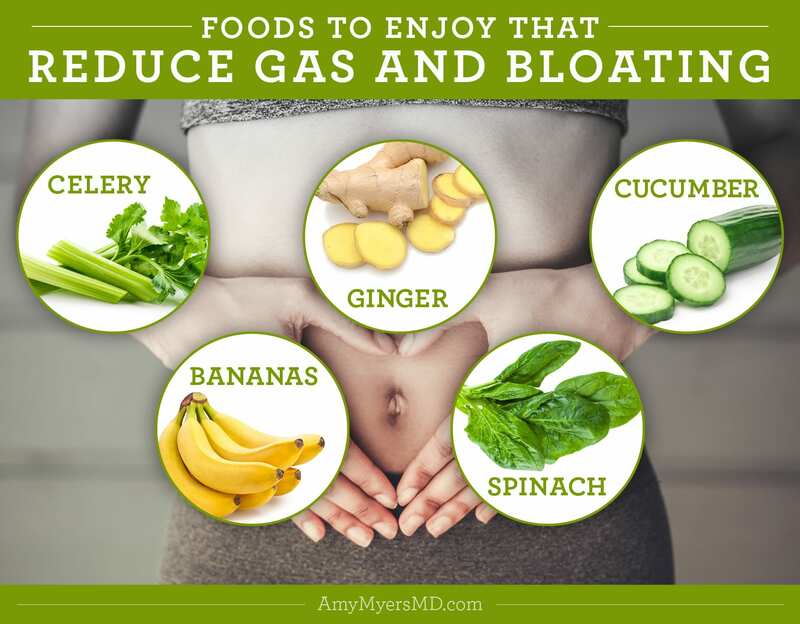 The good news is that what you eat has a HUGE effect on how much gas you experience, and there are many foods that can naturally reduce gas and bloating! First, let’s take a look at a few underlying issues that could be causing out-of-the-ordinary gas and bloating, and when you should be concerned. 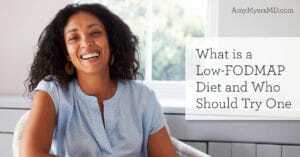 Then we’ll dive into my favorite foods to reduce gas and bloating, and the foods you should avoid that make it worse. Drinking plenty of water, eating smaller meals slowly, and ditching straws and gum can go a long way in reducing gas and bloating. As you’ll see, eating (and avoiding) certain foods can also help. 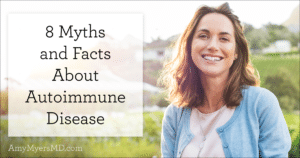 However, there are two underlying gut issues that you should get checked out for if your digestive symptoms are extreme and don’t respond to these lifestyle measures. In my clinical experience, the #1 cause of severe gas and bloating is small intestinal bacterial overgrowth (SIBO). SIBO occurs when the bacteria from your colon and large intestine overgrow and colonize your small intestine. These bacteria feed off of and ferment the undigested carbohydrates in your small intestine, causing a buildup of hydrogen and/or methane gas. If you have SIBO, you must overcome this gut imbalance before you can banish gas and bloating for good. See this article for how to test for and address SIBO. Irritable bowel syndrome (IBS) is sort of a catch-all term for digestive issues that have no other diagnosable cause. In fact, an estimated 50% of people diagnosed with IBS actually have SIBO.3 For the other 50%, there are a number of possible underlying issues that may be causing your symptoms, including leaky gut, Candida overgrowth, parasites, or food intolerances. By getting to the root of your IBS, you can say goodbye to gas, bloating, diarrhea, and abdominal pain once and for all. A low-FODMAP diet has been shown to improve the symptoms of IBS. Celery has an extremely high water content—about 95%—and is also high in potassium, which can help control the water retention associated with bloating.4 Celery has long been used as a digestive aid to control gas, and can even help repair a leaky gut. Insoluble fiber in celery supports healthy bowel movements by regulating both constipation and diarrhea.5 When eating celery, it’s best to cook it first to soften indigestible fibers that may lead to more bloating. Ginger has been used medicinally for thousands of years for all sorts of digestive issues. It can ease bloating by enhancing motility and accelerating stomach emptying.9 What’s more, compounds in ginger such as gingerols and shogaols act as carminatives—substances that reduce flatulence.10 So the next time you’re feeling bloated, try sipping on ginger tea for some natural relief! Spinach is one of the richest sources of magnesium, an essential nutrient in which many people are deficient.11 One cup of cooked spinach offers 39% of the recommended daily intake (RDI) for magnesium.12 Magnesium synthesizes protein and activates enzymes that aid in digestion by breaking down your food into smaller components.13 It also helps maintain bowel regularity by relaxing the muscles in your digestive tract and softening stools.14 For an easy way to get the digestive benefits of magnesium-rich spinach, add a scoop of Organic Greens to water or a smoothie, or simply take a magnesium supplement. Intestinal inflammation due to autoimmune disease, food allergies, SIBO, or other gut imbalances could be the cause of bloating and fluid retention.15 Thankfully, cucumbers contain a flavonoid called quercetin, which fights inflammatory free radicals, reduces allergic reactions, and supports a healthy immune response.16 Quercetin can relieve belly bloat by reducing gastrointestinal swelling. Plus, cucumbers have one of the highest water contents of all vegetables at around 96%!17 Eating cucumbers or drinking cucumber-infused water can help balance your sodium levels, flush excess water from your system, and release trapped gas. Need to fight bloating fast? 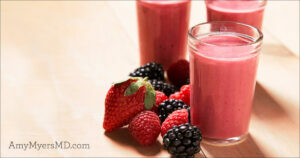 Try making a super powerful smoothie with these 5 belly-slimming foods. 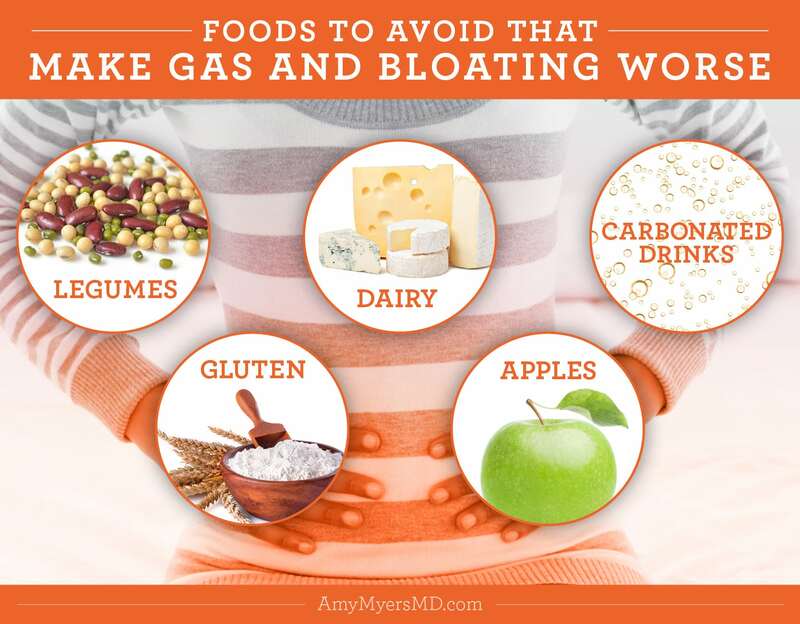 While you’re at it, make sure to avoid the following 5 foods, which will only make gas and bloating worse! Legumes are notorious for causing gas and bloating. 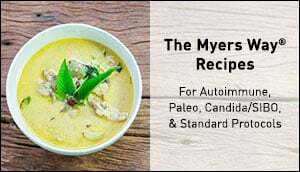 They are high in FODMAPs (fermentable oligosaccharides, disaccharides, monosaccharides, and polyols), short-chain carbohydrates that are difficult to digest. Because they are extremely hard for your body to break down, they get fermented by your gut bacteria and produce a significant amount of gas. I recommend getting rid of legumes for a number of reasons, especially if you have an autoimmune disease. Abdominal pain, bloating, and excessive gas after eating gluten could be a sign of celiac disease or non-celiac gluten sensitivity. However, studies show that even non-celiac patients who are given gluten experience significantly more gas, bloating, and other digestive symptoms than those who receive a placebo.18 One possible reason for this is that foods containing gluten can cause leaky gut. Leaky gut can manifest as a number of digestive symptoms, including bloating, constipation, and diarrhea. Dairy is one of the worst offenders when it comes to gas and bloating. Seventy-five percent of the population is unable to break down lactose, the sugar found in milk and other dairy products. This is due to a deficiency in lactase, the enzyme that digests lactose, otherwise known as lactose intolerance. 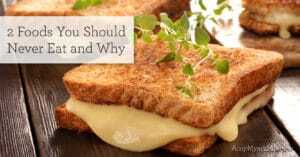 Because of this, lactose ends up being fermented in your gut, leading to bloating, gas, diarrhea, and abdominal pain. Even if you are not lactose intolerant, you could still experience digestive discomfort thanks to dairy proteins casein and whey. These proteins are similar to gluten in terms of being difficult to digest and causing inflammation that can lead to an autoimmune reaction. Although apples can be very good for you, if you are dealing with bloating on a daily basis you may want to lay off. Apples are high in fructose and sorbitol, both of which are FODMAPs and can worsen your digestive symptoms.20 Fortunately, there are a number of equally nutrient-rich fruits to choose from that won’t cause gas and bloating, including berries, citrus fruits, and of course–bananas! You may not suspect something as seemingly harmless as carbonated water to be at the root of your belly bloat! However, swallowing air can cause a buildup of gas in your stomach. Well, guess what’s in those bubbles that make carbonated drinks so enticing? If you avoid all the usual gas-producing suspects, yet always have sparkling water in your hand, this could be the missing piece of the puzzle. Stick to plain water instead, which has the added benefit of keeping you “regular”. Your tummy will thank you! Intestinal gas is a fact of life everyone deals with at some point and can be easily reduced by eating the right foods. That being said, constant, excessive gas and painful bloating could be a sign of something deeper going on. 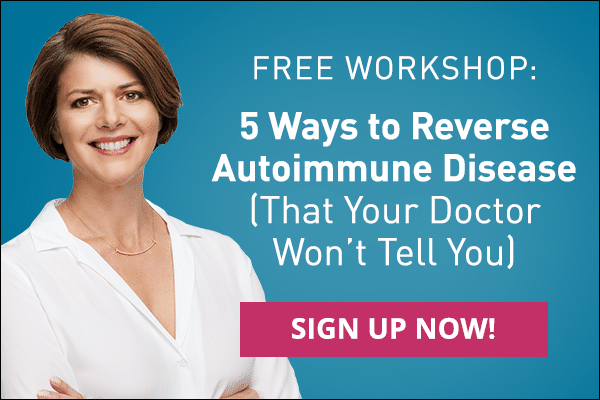 Get tested for SIBO and/or IBS, and make sure you are not dealing with an underlying food intolerance such as gluten sensitivity or lactose intolerance. 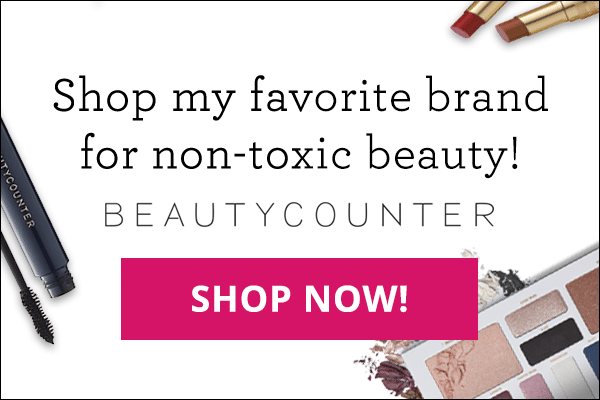 An elimination diet can be helpful for discovering your own personal food sensitivities. My Gut Wellness Smoothie Kit is another great way to support optimal digestive health, repair a leaky gut, and encourage a healthy balance of gut bacteria. This kit includes Leaky Gut Revive®, Paleo Protein, Collagen, and Probiotics 30 Billion so you can supercharge the gut-repairing power of your smoothies! Getting to the root of your digestive troubles and choosing the right foods and supplements will help you beat belly bloat for good, so you can regain your confidence and live life symptom-free!